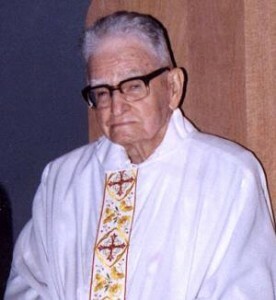 BRISBANE archdiocese’s oldest priest, Msgr Bartholomew (Bart) Frawley, died on January 23 at the age of 97. He was believed to have been Australia’s longest ordained priest. ‘The Mons’, as he was widely known, was a priest for 72 years – a period of quiet but massive achievement, especially in education. Msgr Frawley will be remembered for his major role in developing the Catholic school system on the Redcliffe Peninsula and as ‘a man for all seasons’. He died at Ozanam Villa, Clontarf after suffering two strokes in the same week. Msgr Frawley, who was parish priest at Scarborough from 1946-83, was buried from Brisbane’s St Stephen’s Cathedral on January 31 after a funeral Mass celebrated by Archbishop John Bathersby.